A beach bag or a make-up case with a map of a location special to you both... and a heart to mark a cherished place! Craving the PCH and a convertable today. Stuck in frigid Massachusetts so I'll visit California in my dreams tonight. I hope Gladstones in Malibu is in it, along with las brisas and the stand in Laguna beach, a taco an any dive looking taco stand, the Lowes in Santa Monica, hotel del on coronado and pretty much every where from San Diego to San Francisco. This baby's toes need hot sand! Bahamian sand to be exact. He loves the water and he's going to LOVE the beach! Which island should we visit first? Did you know we have maps images of coliseums and sports parks! They look awesome on pillows, duffel bags and shave kits! We aren't thinking the usual resolutions....exercise, eat healthy, quit smoking... We want to go somewhere. Where do we want to go? The Bahamas...the Exumas to be exact. One of my most life inspiring friends speaks volumes of this area of the world and I NEED to go. I'll snuggle this pillow until I'm basking in the hot Bahamian sun. Problem solved. Not For Navigation gift certificate. They can design their own tote, pillow, accessory, or set of placemats! Naval Base San Diego, sometimes called 32nd Street Naval Station, is the largest base of the United States Navy on… the west coast of the United States, in San Diego, California. This custom pillow captures that area! Treasure island... There must be a lot of them! This one near Florida's St. Petersburg beach looks like coral in the map design featured here. It looks warm and fun too! New Years resolutions are creeping up... We made this pillow adorned with a map of Venice Beach, CA and all I could picture was the outdoor gym, men lifting weights, and lots of sideshows. But...did remind me of working out...and resolutions... And that they would be SO much easier to make and hold if I lived in Southern California instead of frigid Massachusetts. Cheers from the beaches of the Bahamas! Save 15% on your custom map/chart pillow, tote, or set of placemats. While my son sleeps on my lap... Rocking on my glider chair...I'm looking at 2 of our NFN pillows. Both decorated with tropical areas...and I know that if I could rest my head and dream of the islands, the warmth, feeling of hot sand between my toes, the sun beating on my skin... I know that I would be sleeping like a bigger baby than the one on my lap! Home really is where the heart is. I know this because I stay living in Massachusetts even though the weather is enough to make me pack up and drive far west to the southern pacific coast! 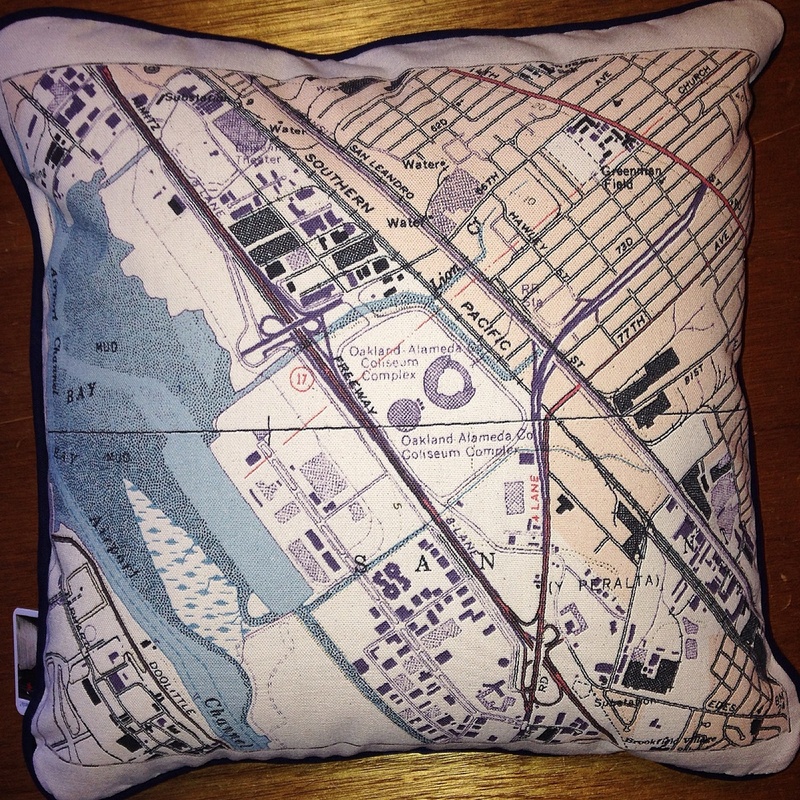 Pillows with a map of home is a great gift for anyone who loves their home, or has had to leave it. Mark an address with a heart and mark a special address.